(727) 397-7706Give Us A Call! Changing Tides Cottages, since 2000, has been providing our guests along with their pets a relaxing, fun-loving vacation spot on Madeira Beach, FL! With our quaint, cute cottages nestled along 180’ of harbor frontage, our guests can hear echoes of ‘Old Florida’… We are only one block to a sugar-sand Gulf beach and two blocks to John’s Pass Village with its lovely boardwalk, restaurants, and shops. For you boaters, we offer numerous deep-water slips. Contact us to book your next vacation! 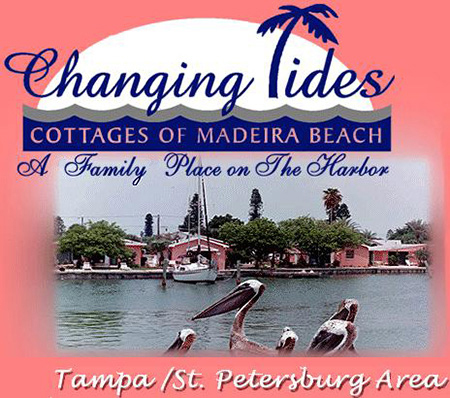 Changing Tides Cottages is the perfect pet-friendly vacation rental in Madeira Beach, FL. We said we ‘accept pets,’ but we mean that we accept all-sizes of pets. Your big dog, no matter what breed, is not too large to come stay with us! Your pups may be with you along the waterfront, on the docks, on your covered deck or patio – off leash – just like they would be at home. The only restriction is that your pet is friendly to both people and other animals. Changing Tides Cottages IS your home away from home for relaxing with your furry friends. We are an enclosed compound so your canine companions can be safe with you off leash on the grounds. Our cottages provide a wide array of amenities, from fully-equipped kitchens, covered patios, and decks, to picnic tables and gas grills. We try to keep our cottages well-stocked for serving as your home away from home. We offer 180 feet of waterfront amidst common areas, lush with tropical landscaping and vegetation. Our covered gazebo area with ample seating allows our guests to gather in a relaxed, intimate setting situated about five feet from the harbor — the perfect spot for watching herons, gulls, cormorants, anhingas, dolphins, and manatee. Changing Tides Cottages is truly a hidden gem of a vacation spot for you and your pets! Madeira Beach is at the heart of Florida’s Central Gulf Coast, close to Tampa, Sarasota, Clearwater and St. Petersburg – the Tampa Bay area. Each city offers many cultural options, including theatres, art galleries, museums, aquariums, and professional sports such as baseball, football, soccer, and the Firestone Grand Prix racing. Our pet-friendly cottages are completely surrounded by beautiful beaches and warm tropical waters. Madeira Beach is three square miles, and two of it is water! We are a pet-friendly resort and welcome all friendly large and small pets. We’re close to hundreds of restaurants, shops and endless fun. Go to the Cottages page and pick one out, then let us know your preference ! Our business has more than 18 years of on-site, small resort management experience. We are owner-operated and live on the premises. We take pride in our A+ rating with the Better Business Bureau (BBB).